For many wheelchair users, the prospect of going to the shops and elsewhere can seem incredibly daunting, especially if you have only recently been confined to a wheelchair. A lot of shops and public places are not designed to accommodate wheelchairs, which can therefore make you feel reluctant to venture out of your home at all. Fortunately, more public places are making themselves accessible to people who use mobility equipment like powered wheelchairs and powered scooters, but sadly, there are still many places who do not feel the need to adapt themselves. 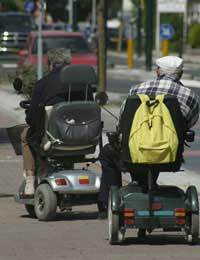 If your nearest shops are too far away to easily get there in your wheelchair or scooter, check your local area to see if this option is offered by shops or local authorities. Mobility buses provide transport to and from shops for those who cannot get there otherwise, and are accessible to wheelchair users. For some, this is literally the only way that they can get to do their weekly shopping, particularly if there are no shops in the immediate vicinity and they don't drive. Shopmobility schemes allow you to borrow mobility equipment like wheelchairs (both manual and powered, but usually the latter) and powered scooters to use whilst shopping. They are usually restricted to shopping centres, rather than supermarkets. For those who are blind or partially sighted, it may be possible to arrange for someone to help to carry your shopping, but this will usually require advance notice. Contact your local scheme to find out more about their services, as opening hours, user charges and other details are likely to vary across different schemes. Some schemes will charge a fee to use the service, but this is not the case across the board as some schemes are completely free of charge. The National Federation of Shopmobility UK (NFSUK) has a Directory tool that you can use to find your local scheme. If you're using the scheme for the first time, take along some form of identification that features your name and address. This enables a registration form to be filled in on your behalf, as well as allowing your details to be stored for future reference. For future visits, you may be given a membership card to present. If this is the case, there is likely to be an annual or one-time fee to use the service. After a discussion of the type of mobility equipment that best suits your needs and a safety briefing, you're ready to start shopping! Remember to maintain a steady speed at all times and consider other shoppers, especially when going round corners. Shopmobility schemes are a great way to negotiate big shopping centres that would otherwise prove extremely difficult for you to get around on foot, especially when you factor carrying shopping into the equation! Some places of interest are not equipped to accommodate disabled visitors, but many are now aware of the need to provide facilities for wheelchair users. Contact the relevant tourist information office for more details on whether wheelchairs can be accommodated.